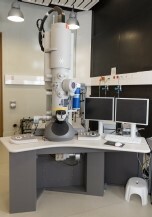 Description:The FEI Tecnai G2 T20 is MCEM’s main training transmission electron microscope (TEM) used for conventional imaging (CTEM), diffraction and microanalysis (EDS) work on a very wide range of materials science problems ranging from nano-materials, metal alloys, polymers to ceramics and minerals. The T20 employs a gun / column isolation valve, making for extremely rapid sample exchanges with the emitter and HT running. Point or area X-ray spectra can be recorded from the sample region under observation allowing for rapid chemical identification of the material. Technical Configuration: 200kV; LaB6 emitter; Twin lens; 5-axis compustage; column isolation valves for rapid sample exchange; Orius SCD200D wide-angle CCD camera (diffraction capable); Orius SC600 high-resolution CCD camera; Bruker 30mm2 ultra-thin window SDD and Quantax analysis system; single tiliting holder; 3-position single titling holder; beryllium (low background) double-tilting analytical sample holders; plate film or imaging plate capability. Authorised by: Chief Marketing Officer, Strategic Marketing and Communications. Maintained by: Monash Centre for Electron Microscopy Webmaster Team. Last updated: Sep 2017.